To a large bowl add the coconut milk, tom yum paste, onion and zucchini. Stir to combine. Put your pumpkin onto an oven tray. Pour the coconut milk mixture into the pumpkin. There may be some left over. Use this to top up the pumpkin as it cooks. 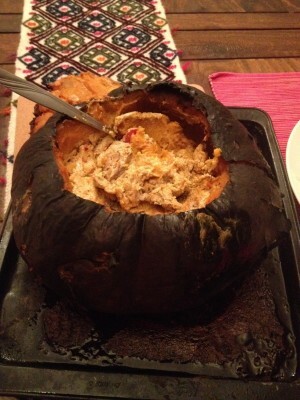 Put the pumpkin into the oven and cook about 45 minute in the kitchen oven or 30-40 mins in the cob oven. Check and top up the filling once or twice. To serve, take out the whole pumpkin, add a spoon and invite guests to stir the inside flesh with the coconut mixture before spooning into bowls. If you dont use it all, store the whole pumkin in the fridge. Reheat in a warm oven and top up the middle with leftover coconut milk mix for a repeat meal. The skins looks bad but boy is it good inside!